This rugby season, I have treated nine players who sustained ankle syndesmosis injuries. To familiarise myself with the anatomy, I pulled out my trusty Moore Anatomy textbook, however found the information available very limited. The goal of this blog is to detail the anatomy and function of the ankle syndesmosis, to allow more effective and efficient treatment of this region. Picture 1. Anterolateral view of left ankle, showing AITFL and interosseous membrane. (Williams 2015, pg 92). A syndesmosis joint is a fibrous joint where two bones are connected by strong ligaments or membrane. 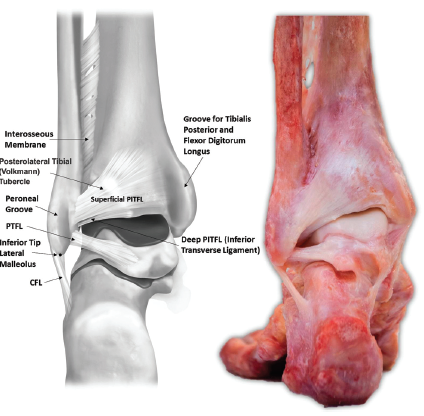 The distal tibiofibular syndesmosis, between the fibula and tibia, is formed by three major ligaments: the anterior inferior tibiofibular ligament (AITFL), the posterior inferior tibiofibular ligament (PITFL), and the interosseous tibiofibular ligament (ITFL). A fourth ligament, the inferior transverse tibiofibular ligament, is congruent with the PITFL, but sometimes considered a separate ligament (Hermans, Beumer, de Jong, & Kleinrensink, 2010). While technically the syndesmosis is the joint, most literature describes a syndesmosis injury as affecting the syndesmotic ligaments, so this blog will do the same. These ligaments combine to provide exceptional stability to the ankle, with the fibula only externally rotating a maximum of 2° relative to the tibia, and the ankle mortice widening 1mm as the ankle ranges from full dorsiflexion to plantarflexion (Lin, Gross, & Weinhold, 2006). It is reported ankle syndesmosis injury occurs in 1-11% of all ankle sprains without fractures, however 40% of patients report ankle instability six months post-ankle sprain. The instability could result from widening of the ankle mortice following stretching of the ligaments. A 1mm widening of the ankle mortice (doubling the amount of motion in asymptomatic individuals) decreases the tibiotalar joint contact area by 42%, causing instability, with resultant osteoarthritis (Hermans et al., 2010). Given 1mm change in mortice width causes clinical significance, I believe syndesmosis injuries are under-reported in the literature. Possibly with improved CT & MR imaging now available, the incidence of syndesmosis could become higher than 11%. Picture 2. Anterolateral view of AITFL. (Williams 2015, pg 93). The AITFL attaches from the anterior tubercle of the distal tibia to the anterior fibular at the lateral malleolus. The ligament consist of 3-5 bands, depending on an individuals’ anatomy (Williams et al., 2015). Collectively, the bands form a trapezoid with short accessory bands proximally, and dense, long primary bands distally. 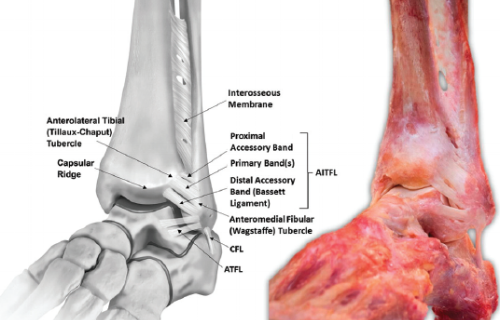 The AITFL runs obliquely from tibia to fibula, at an angle of 35° to the horizontal (Golano et al., 2010). 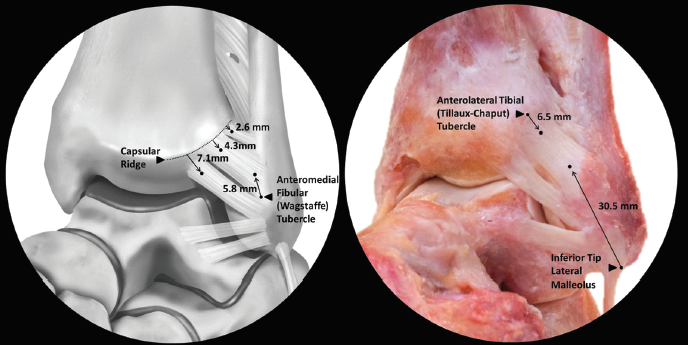 The centre of the tibial insertion of AITFL is 9.3mm superomedial to the anterolateral tibial plafond, with the fibular insertion of AITFL being 30.5mm anterosuperior to the inferior tip of the lateral malleolus (Lilyquist, Shaw, Latz, Bogener, & Wentz, 2016; Williams et al., 2015). Picture 3. Open-book view of AITFL attachments. (Williams 2015, pg 93). Picture 4. Posterior view of ankle (Williams 2015, pg 94). The PITFL is also trapezoidal, with superior fibres attaching along the distolateral margin of the posterolateral tibial tubercle, then blending into the posterior tibial cortex (Williams et al., 2015). It is almost continuous into the interosseous membrane, located superior to the PITFL (Ebraheim, Taser, Shafiq, & Yeasting, 2006). The PITFL is made up a superficial ligament and deep ligament (often called the inferior transverse tibiofibular ligament). The superficial fibres are located 26.3mm from the inferior tip of the lateral malleolus, with the centre of the ligament 8mm from the posterolateral tibial plafond, while the deeper fibres are denser and attach to an oval-shaped insertion on both the fibula and tibia (see picture 5) (Williams et al., 2015). Picture 5. Posterior view of ankle (Williams 2015, pg 94). The pyramidal network between the fibular notch on the tibia and the medial fibula is the interosseous tibiofiular ligament (Ebraheim et al., 2006). The ligament consists of dense, short ligamentous fibres and adipose tissue, arising from the interosseous membrane 49.4mm proximal to the tibial plafond and 70.4mm proximal to the lateral malleolus inferior tip (Williams et al., 2015). The fibres descend laterodistally from the tibia to the fibula, terminating 34.5mm superior to the lateral malleolus inferior tip. The ITFL is a distal continuation of the interosseous membrane (IOM), with differences of opinion on the function of the ligament. Some say the ITFL is insignificant, while others claim it is the primary stabilising structure between the tibia and fibula and is crucial in ankle stability (Golano et al., 2016; Hoefnagels, Waites, Wing, Belkoff, & Swierstra, 2007). Picture 6. Open-book view of interosseous tibiofibular ligament (Williams 2015, pg 95). Now we understand the anatomy of this region, our management of "syndemosis injuries" should be more targeted. In particular, palpating the AITFL as well as palpating the talofibular ligaments (ATFL, CFL, PTFL). Most physiotherapists palpate the distal fibula to rule out a potential fracture, and determine which talofibular ligaments are injured. We should also palpate higher up the anteromedial border of the fibula, along the AITFL, and check for pain and swelling. If there is pain in this area, we should treat as a syndesmosis and lateral ankle sprain. We should compress the tibiofibular region, and stabilise the talofibular region, and avoid deep weighted dorsiflexion e.g. squats, knee to wall stretch. A thorough, detailed assessment and conservative and medical management will be outlined in future blogs, this is just a starting point to enhance our anatomy, and palpation skills. More blogs to come!! Ebraheim, N. A., Taser, F., Shafiq, Q., & Yeasting, R. A. (2006). Anatomical evaluation and clinical importance of the tibiofibular syndesmosis ligaments. Surgical and Radiologic Anatomy, 28(2), 142-149. Golano, P., Vega, J., de Leeuw, P. A. J., Malagelada, F., Manzanares, M. C., Gotzens, V., & van Dijk, C. N. (2016). Anatomy of the ankle ligaments: a pictorial essay. Knee Surgery Sports Traumatology Arthroscopy, 24(4), 944-956. Golano, P., Vega, J., Leeuw, P. A. J., Malagelada, F., Manzanares, M. C., Gotzens, V., & van Dijk, C. N. (2010). Anatomy of the ankle ligaments: a pictorial essay. Knee Surgery Sports Traumatology Arthroscopy, 18(5), 557-569. Hermans, J. J., Beumer, A., de Jong, T. A. W., & Kleinrensink, G. J. (2010). Anatomy of the distal tibiofibular syndesmosis in adults: a pictorial essay with a multimodality approach. Journal of anatomy, 217(6), 633-645. Hoefnagels, E. M., Waites, M. D., Wing, I. D., Belkoff, S. M., & Swierstra, B. A. (2007). Biomechanical comparison of the interosseous tibiotibular ligament and the anterior tibiofibular ligament. Foot & ankle international, 28(5), 602-604. Lilyquist, M., Shaw, A., Latz, K., Bogener, J., & Wentz, B. (2016). Cadaveric Analysis of the Distal Tibiofibular Syndesmosis. Foot & ankle international, 37(8), 882-890. Lin, C. F., Gross, M. T., & Weinhold, P. (2006). Ankle syndesmosis injuries: Anatomy, biomechanics, mechanism of injury, and clinical guidelines for diagnosis and intervention. Journal of Orthopaedic & Sports Physical Therapy, 36(6), 372-384. Williams, B. T., Ahrberg, A. B., Goldsmith, M. T., Campbell, K. J., Shirley, L., Wijdicks, C. A., . . . Clanton, T. O. (2015). Ankle Syndesmosis A Qualitative and Quantitative Anatomic Analysis. American Journal of Sports Medicine, 43(1), 88-97.